Dispatcher Ty McGee monitors calls for assistance in Cecil County's Department of Emergency Services. That’s what happened to Carl Henn on July 25, 2010. The 48-year-old was having a picnic with some friends at a park near his home in Rockville. When a sudden thunderstorm rolled in, the group scattered, running for cover in their cars. After about 10 minutes, the storm passed, and that’s when the group found Henn lying on the ground unconscious. He had been struck by lightning. Two people began CPR while others frantically called 9-1-1 from their cell phones. But they got busy signals. Carl Henn died two days later. At the time, Montgomery County’s 9-1-1 center was inundated with calls about things like fallen trees. The Washington Post reported that the 9-1-1 center received five times more calls in the hour during and after the storm than in the hour before the storm hit. State Sen. Cheryl Kagan, who represents Gaithersburg and Rockville, said Henn was one of three of her constituents who died when 9-1-1 didn’t work. For the last two years, Kagan unsuccessfully introduced bills aimed at modernizing the state’s 9-1-1 system. This year, she has five bills designed to move the state toward what’s known as Next Generation, or Next Gen, 9-1-1. Twenty states have begun building a Next Gen 9-1-1 system, as have local jurisdictions in another 12 states, Kagan said. “We are vulnerable based on a freak weather accident, … a train derailment, or God forbid, a terrorist attack,” she said. AT&T made 9-1-1 the nationwide emergency phone number in 1968. But in the time since, the technology hasn’t changed much, said Richard Brooks, director of Emergency Services for Cecil County. Meanwhile, the technology consumers use to reach their local emergency services has changed drastically. Brooks held up his smartphone. There have been times when callers could have used those features. Brooks recalled an incident in which a woman called Cecil County’s 9-1-1 center while hiding on the second floor of her home. The Next Gen 9-1-1 system “allows consumers to use voice, video, text and data all at once so they can have a very rich experience of 9-1-1,” said Trey Forgety, director of government affairs and information security for the National Emergency Number Association, which represents everyone involved in making 9-1-1 work. “If they see, you know, a creepy van and say, 'Hey, I'm worried this might be like a bombing attempt or something,' they can actually send a picture of that directly to the 9-1-1 center, along with their voice call,” Forgety said. But texting and multimedia messages are just a small part of the system. Most of the improvements involve how the system functions behind the scenes. For example, the system improves call routing, so that calls are more likely to end up at the closest call center and avoid a transfer. They also enable multi-party calling, allowing 9-1-1 call-takers to conference someone who can translate another language in a voice call or, in the case of American Sign Language, a video call. And the system improves the 9-1-1 network’s reliability, resiliency and security, Forgety said. Those are the aspects of the new system that might prevent someone from getting a busy signal. 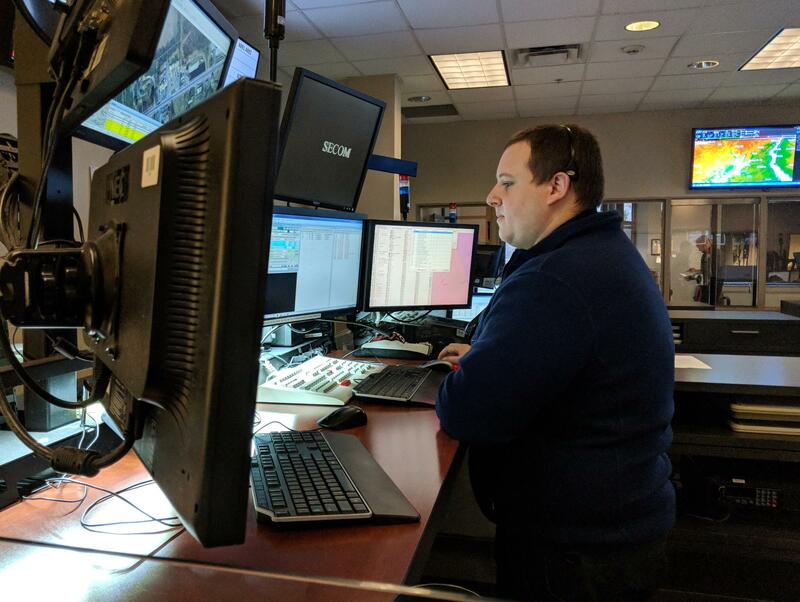 If a major storm overwhelms the Washington, D.C. suburbs, Next Gen 9-1-1 could send some calls instead to the other side of the state, where a 9-1-1 call-taker can begin assisting callers. "It would be seamless,” Brooks said of this feature. But he also said Next Gen 9-1-1 will require a bigger staff and more training, and all of that costs money. It could be a while before anyone — the public or public safety officials — see any of the new system. “The big challenge is how is it paid for, because we’re still paying for 9-1-1 the way we did originally,” Brooks said. Currently Maryland residents pay a monthly $1 9-1-1 fee on their phone bills. That covers less than 40 percent of 9-1-1 centers’ operating costs, Kagan said, even before adding the costs of a new Next Gen 9-1-1 system. The problem isn’t the size of the fee, she said. One of Kagan’s five 9-1-1 bills would increase the monthly fee on a scale based on the number of phone lines. A bill with one or two lines still has a $1 fee; three to five lines gets a $2 fee; six to 10 lines gets a $3 fee, and so on. It’s scheduled for a hearing Tuesday afternoon. Her other bills each focus on other parts of the process of modernizing 9-1-1. One creates a commission in charge of helping Maryland’s 24 jurisdictions transition to Next Gen 9-1-1 and identifying any possible barriers to the process. The others deal with pay for 9-1-1 call takers, privacy for photos and videos sent to 9-1-1, and making sure the system meets national standards. The bill that creates a Next Gen 9-1-1 commission has made the most progress. It has already passed the state Senate and is scheduled for a hearing in the House of Delegates next week. If it succeeds, Kagan said, the commission will begin meeting immediately. “The commission will make its recommendations, but in the meantime, we are going to be implementing Next Gen,” she said. Last month, Gov. Larry Hogan announced that 9-1-1 centers statewide will be able to receive text messages. The service could begin in some jurisdictions as soon as this spring. Forgety described the text messaging capability as a precursor to the true Next Gen 9-1-1 system, but a good first step.